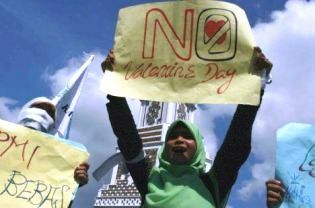 Faisal Ali who is chairman of the Aceh branch of Nahdlatul Ulama called on Muslim parents, especially those in Aceh, Indonesia to instruct and supervise their children and stop then from celebrating Valentine's Day. “We must prevent the Muslim younger generation in Aceh from being poisoned by a culture that contradicts our Muslim values. Therefore, everybody, parents in particular, should give our youth the proper guidance,” he said. “Islamic Sharia cannot prevail in Aceh as expected if it is not supported fully by the government and other parties in authority,” he said. "The government must also watch out for youths participating in Valentine’s Day activities in Aceh," he said. Over the last decade Valentine's Day has become increasingly popular around the Muslim World. Young couples gather to have parties under private security. This year also these parties will be held in Indonesia, Pakistan, Bahrain and many Arab countries. The youth feels suffocated by Shariah Laws and the Imams who freely give Fatwas on social issues. The parties will continue around the Muslim Worlds, as they should and hopefully the clerics will not dampen the spirit of the youth. Please leave a comment, let us know what you think. Like us on Facebook, and express your opinion.